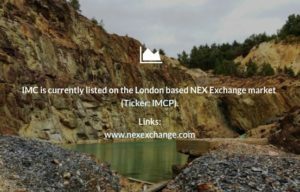 The Directors of IMC Exploration Group plc are pleased to present the audited financial results for IMC for the twelve months to 30th June 2018. During this period, IMC undertook a strategic review of all its projects. The directors of IMC are now focused on its three main projects in Ireland – tailings and spoils project in Avoca, Co. Wicklow, our north Wexford gold project and the zinc project located close to the Kilbricken deposit in Tulla, Co. Clare. Concentrating on these three main projects will accelerate progress to realising the potential of IMC’s valuable assets for the benefit of all shareholders. IMC has been engaged in exploration work on its spoils and tailings project in Avoca, Co. Wicklow with Trove Metals Limited, culminating in the engagement of CSA Global to prepare a Mineral Resource Estimate (MRE) for the Avoca tailings and spoils project. This Mineral Resource will be classified as inferred and will be reported in accordance with the JORC Code (2012). Classification of this MRE is being carried out, taking into account the volumes of the spoils, quality of the sampling and density data and sample spacing. Furthermore, IMC have engaged CSA Global to carry out a JORC Code (2012) compliant Competent Person’s Report. IMC continues with its work on its highly prospective north Wexford gold project. Drilling and float sampling indicates that the Kilmichael area contains significant gold grades in a structurally complex setting. IMC intends to continue with its exploration programme on this licence area. During this financial year IMC carried out drilling on PL 2739, Tulla, Co Clare. The presence of haematisation in Waulsortian limestones, in conjunction with the hydrothermal breccias intersected, confirms the presence of a potential base metal-bearing hydrothermal system and enhances the prospectivity of licences in the Tulla area. IMC has made positive progress on all fronts; with our JORC Code (2012) compliant CSA Global Mineral Resource Estimate pending, our JORC Code (2012) compliant CSA Global Competent Person’s Report pending, the implementation of the Koza Report on our north Wexford project and further exploration work on our zinc project in Co Clare it is expected that significant value will be added to IMC in the coming years. I would like to thank our shareholders for their continued support and trust. Expenditure on exploration activities is deferred on areas of interest until a reasonable assessment can be determined of the existence or otherwise of economically recoverable reserves. No amortisation has been charged in the period. The directors have reviewed the carrying value of the exploration and evaluation assets and consider it to be fairly stated at 30 June 2018. The recoverability of the exploration and evaluation assets is dependent on the successful development of the group’s licence areas.